Funeral Flower Arrangement Two includes a Lavender and White Spray, Basket, Inside Casket Spray, Floor Arrangement, Beautiful Purple Casket Spray, Tea Leaf Heart and a gorgeous wreath. 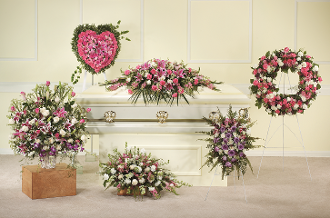 All our funeral flowers are made with dedicated designers who care for each individual flower for your loved ones. Each florist cares for your time and for your loss. You will see that in each fresh flower for your loved ones funeral in Los Angeles.